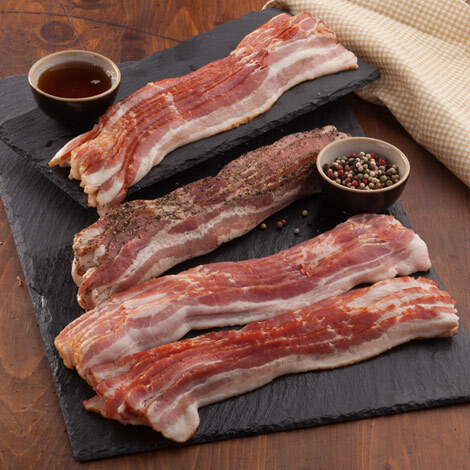 This delicious assortment of Amana Smoked Bacon is packed with flavor. Rise and shine to any one of four great tastes. This was a birthday gift. It arrived on time and was most gratefully received. Absolutely the best bacon ever! My sister and I order regularly and we get excited when it's time to restock. Got the bacon sampler for my siblings and they all raved about it. Next time I need to order some for myself! Always quality products and hassle-free shipping!! Thank you so much for your quality products and hassle-free shipping! I use Amana every year fir Christmas and birthday gifts. You always have the best quality bacon. My boyfreind loves it so I always get him an assortment at Christmas. But his favorite is the peppercorn bacon, and it is so convenient that with an assortment you can order 1lb ride alongs, so I can get 2 or 3 lbs of peppercorn bacon to go with, which makes my boyfriend very happy. Thank you for having such a quality product and convenient options. I purchased the bacon sampler for a niece and as far as I know they love it. Ordered bacon sampler. Delicious! Also love the ride along specials, loved the beef jerky! Iowa bacon conveniently shipped to the door is a great delight! Four types of bacon, my favorite is maple with a secondary of pepper. The meat has lower fat content than most grocery store bacon. I am so pleased with the bacon and Amana's customer service that I order this pack repeatedly for myself and for gifts. After all, everything is great with bacon and even more so when it is quality brought to your door! Ordered on Tuesday - received on Wednesday! Well packed in Styrofoam cooler with dry ice. Greatest bacon - lean, and every flavor is delicious. I recently received a large order which I needed my a specific date because I was having company for a week. Amana Meats exceeded my expectations this time and on previous orders. Delicious and excellent customer service. Our family has always enjoyed the bacon from Amana Meat Shop so I'm glad to be able to stock up when I can. Iowa bacon is the best! Excellent flavor and variety! Made a fettuccine with the maple wood bacon and peas in a cream sauce. It was terrific. You can never have too much Bacon in the house. Great variety and each one a special flavor. Cut to perfection as well. No complaints anywhere. The bacon sampler is outstanding. The maple smoked bacon is the best we have ever had. The bacon couldn't be better. Best Bacon There Is !! I grew up in Iowa and moved to NYC over 40 years ago. I used to buy this bacon and take it back on the airplane, now I have ordered it for years and years. This is the Best Bacon There Is !!! I have bought this gift for a lot of people over the last couple years. Before that, I ordered hams, salami and cheese gifts, etc. Everyone I've talked to has enjoyed it all, but they're especially grateful for the bacon. I work for Standard Forwarding in Milwaukee,We get a package of your bacon sampler every year and its great! We ordered a sampler gift box of bacon and it is awesome as usual but it took 5 day to get to Kenosha Wi. not good! Amana Response: Thank you so much order and feedback. We ship orders as soon as possible after receiving them. We received your order on Sunday, January 15. We normally would have shipped to you the very next day, however, an ice storm hit Iowa on Monday, January 16th and we were unable to ship any packages that day. We shipped your bacon sampler on Tuesday, January 17th and it was delivered to you in the 2-day UPS shipping window on Thursday, January 19th. Hope that helps explain our shipping (and delays due to Iowa winter weather). Please contact us directly if you ever have questions on your order. We are so glad you enjoy our Amana Bacon! Never had better bacon. Gave this as a gift and will be doing it again soon. 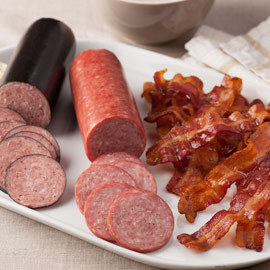 The bacon sampler was sent as a thank you gift to family in Illinois. They raved about it!! Shipping was quick. I send the bacon annually to friends that look forward to it every year. I appreciated the service received when sending a repeated order to some friends. I couldn't remember what I usually sent and wrote one thing but wrote, "please do what I usually do." I was called and e-mailed to ensure what I wanted sent was correct. I appreciate that additional service. I had eaten your peppered bacon before and loved, so I tried the sampler. Every flavor is exceptional. I love the thick cuts and full flavor. My order arrived in perfect condition and online. I'll be back for more. Stovetop method: Place bacon in a cold pan. Turn on heat and simmer low and slow, turning once to brown both sides. Cooking times will vary depending on how you prefer your bacon. Less for chewy, a bit longer for crispy. 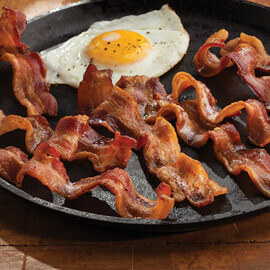 For other suggestions on cooking the perfect bacon, see our Cooking & Serving Instructions.